The history of GMAW or Mig tracks developments in power supply and the understanding of how that relates to the speed of a continuous fed electrode wire. Advances in understanding how gases can be combined also contributed to the creation of an optimal shield for the process. The choice of gas will effect the finished weld profile. Short-circuit (GMAW-S): a solid metal-cored wire electrode is depostied during repeated electrical short circuits. 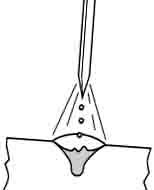 Globular Transfer: A continuously fed solid or metal-cored wire electrode is deposited in a combination of short-circuits and gravity-assisted large drops. 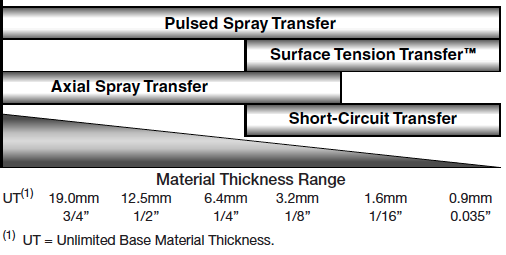 Axial Spray Transfer: high energy mode where a continuously fed solid or metal-cored wire electrode is depostied at a higher energy level, resulting in a stream of small molten droplets. The droplets are propelled axially across the arc. Pulsed Spray Transfer (GMAW-P): Related to axial spray transfer, wehre the welding current is cycled between a high peak current level to a low background current level. Today, GMAW is used for a side variety of material thickness and material type. Electrodes are selected based on the thickness of the materials to be welded and the recommended current range. The principles of Mig Welding History began to be developed around the turn of the 19th century, with Humphry Davy's discovery of the electric arc in 1800. At first, carbon electrodes were used, but by the late 1800s, metal electrodes had been invented by N.G. Slavianoff and C. L. Coffin. In 1920, an early predecessor of GMAW was invented by P. O. Nobel of General Electric. It used a bare electrode wire and direct current, and used arc voltage to regulate the feed rate. It did not use a shielding gas to protect the weld, as developments in welding atmospheres did not take place until later that decade. In 1926 another forerunner of GMAW was released, but it was not suitable for practical use. The official start of Mig welding history is 1948. It was not until 1948 that GMAW was finally developed by the Batelle Memorial Institute. The work was sponsored by the Air Reduction Company with the work conducted by Devers and Hobart. It used a smaller diameter electrode and a constant voltage power source, which had been developed by H. E. Kennedy. The process relied on an aluminum continuous fed electrode. Shielding was with argon gas. It offered a high deposition rate but the high cost of inert gases limited its use to non-ferrous materials and cost savings were not obtained. Used an axial spray transfer process. Spray transfer refers to a process where tiny molten metal droplets are sprayed across the arc in the same way water is sprayed through a small hole in a garden hose nozzle. When the current is higher than the transition current, the electrode sprays onto the work in small droplets. These droplets detach and form at the rate of several hundreds per second. In 1953, the use of carbon dioxide as a welding atmosphere was developed, and it quickly gained popularity in GMAW, since it made welding steel more economical. In 1958 and 1959, the short-arc variation of GMAW was released, which increased welding versatility and made the welding of thin materials possible while relying on smaller electrode wires and more advanced power supplies. Enabled short-circuiting transfer where the electrode touches the work and short circuits. This causes the transfer of metal at the rate of 20x to 200x per second. Excessive current results in excessive spatter. It quickly became the most popular GMAW variation. The spray-arc transfer variation was developed in the early 1960s, when experimenters added small amounts of oxygen to inert gases. Many developments in the 1960's were the result of improvements and research in power sources. More recently, pulsed current has been applied, giving rise to a new method called the pulsed spray-arc variation (GMAW-P). This process was based on research from the 1950's which used high-speed transition between a high-energy peak current to a low background current. Puled arc process uses axial spray transfer to reduce spatter and incomplete fusion defects. Additional developments in power source technology enabled improvements in GMAW-P and the GMAW process. Introduction of thyristor power sources. These devices can control a large amount of voltage and power with a small device (commonly used in light dimmers). Work completed by the Welding Institute of the United Kingdom determines the linear relationship between wire feed speed and pulsed frequency. Led to the development of synergic (one knob control) transistor controlled power sources which gave more control to the welder in the shop. The knob controls the wire feed speed and the amount of pulsed energy applied to the arc. The process improved the ease of use related to GMAW-P.
Major developments by Lincoln Electric including computerized controled circuits and software to control the optimal arc welding programs. Lincoln Electric introduces STT (Surface Tension Transfer) which uses a power source that reacts to the requirements of the arc. Power is generated by a waveform generator, a technology is doesn't require constant current or a constant voltage power source. In the Lincoln technology the power operates independently of the wire speed. Today, GMAW is one of the most popular welding methods, especially in industrial environments. You can call it the glory days of Mig welding history. It is used extensively by the sheet metal industry and, by extension, the automobile industry. There, the method is often used to do arc spot welding, thereby replacing riveting or resistance spot welding. It is also popular in robot welding, in which robots handle the workpieces and the welding gun to quicken the manufacturing process. 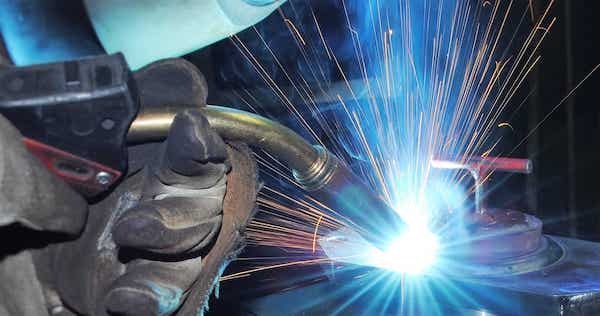 Generally, it is unsuitable for welding outdoors, because the movement of the surrounding atmosphere can cause the dissipation of the shielding gas and thus make welding more difficult, while also decreasing the quality of the weld. The problem can be alleviated to some extent by increasing the shielding gas output, but this can be expensive. In general, processes such as shielded metal arc welding and flux cored arc welding are preferred for welding outdoors, making the use of GMAW in the construction industry rather limited. Furthermore, the use of a shielding gas makes GMAW an unpopular underwater welding process, and for the same reason it is rarely used in space applications. The future of Mig welding history has never been brighter. The Weld Guru is based on information from multiple sources including U.S. Army Operator Circulars, O.S.H.A and our own first hand experience with Welding. It is not a replacement for manufacturers directions and is only to provide reminders for experienced welders. We do accept advertising and receive some compensation when we mention select products and services. This in no way influences any recommendations. Our goal is to act with honesty and integrity at all times.